Valley Center, CA - February 23, 2009 – By Nolan Dalla - (PRESS RELEASE) -- The world's largest and most prestigious poker tournament series is returning again to Southern California. For the sixth consecutive year Harrah's Rincon, the San Diego area's premier gaming and resort destination, will be hosting a World Series of Poker Circuit event. This year's 13-day tournament series takes place from March 19th through April 1st, 2009. The World Series of Poker is the world's richest sporting event. Last year, the WSOP competition in Las Vegas alone awarded nearly $170 million in prize money to winners - more than Wimbledon, the Masters, and the Kentucky Derby combined. Five years ago, the WSOP hit the road for the first time in history. Poker tournaments were offered at multiple Harrah's properties spread throughout the United States. Rincon was one of the first casinos ever to host a WSOP-related event held outside of Las Vegas. Turnout has been strong every year, making Rincon one of the Circuit's most popular attractions. This year's action-packed schedule includes 12 major daily tournaments, plus ten more late afternoon tournaments - bringing the combined menu to 22 total tournaments. This makes the upcoming Rincon series one of the busiest poker destinations of the season. In addition, the Rincon Poker Room will offer multiple satellites and around-the-clock cash-game action. The Harrah's Rincon Casino and Resort is nestled in a quiet valley between the mountains 45-miles northeast of San Diego. Rincon, which has multiple dining, entertainment, and spa/fitness options for guests of all ages, is a convenient destination for poker enthusiasts throughout Southern California. In years past, Rincon's WSOP Circuit tournaments have attracted thousands of poker players with all levels of experience, from recreational competitors to world champions. Former WSOP champions Doyle Brunson, Chris "Jesus" Ferguson, Greg "Fossilman" Raymer, and Jerry Yang have attended in recent years. Rincon has also been visited by other poker greats, including Phil Ivey, Daniel Negreanu, Berry Greenstein, Phil Gordon, Chris Moneymaker, Annie Duke, Howard Lederer, Scotty Nguyen and many other superstars. This year's poker tournament schedule includes a wide variety of poker games, including Limit Hold'em, No-Limit Hold'em, Pot-Limit Hold'em, Omaha High-Low, Seven-Card Stud High-Low, and H.O.R.S.E. In addition, there will be a ladies-only poker tournament and a special tournament for seniors. Tournament buy-ins start as low as $125. The Rincon championship event will be played on the final three days of the series (March 30th through April 1st) and will cost $5,150 to enter. Super-satellites for the championship event costing as little as $65 will be held daily, 24-hours a day. "Harrah's Rincon is proud to be a fixture on the World Series of Poker Circuit," said Robert Livingston, Vice President & Assistant General Manager at Harrah's Rincon. "I know all our casino and hotel employees look forward to the excitement of this big-time tournament coming to Southern California. This year, we really intend to roll out the red carpet for everyone, whether they just want to play a little poker for fun or strive to become a world champion." This year's tournament director is Jimmy Sommerfeld, one of poker's most respected and experienced gaming officials. The Harrah's Rincon poker room manager is Alexia Alsop, who will be working with her staff to coordinate San Diego's premier poker event. Additional staffing will be provided by the elite and prestigious Poker Tournament Consultants group. 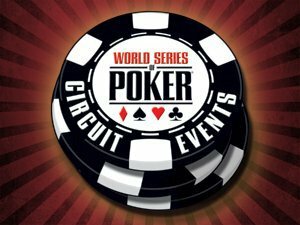 To kick things off, Harrah's Rincon will host a "World Series of Poker Boot Camp," held on March 15th. The hands-on instructional series has proven to be wildly popular and immensely helpful to poker players of all levels. The special $399.99 package includes poker lessons from experts, entry into two daily poker tournaments (to be held Sunday, March 15th at 7 pm and Monday March 16th at 12 noon), a seat into a WSOP satellite tournament, a choice of hotel room accommodations, and a $50 food and beverage credit. This tremendous package value can be booked online at: www.harrahs.com. Later, on March 27th, Eric Lynch will be in attendance for a book signing. He is the author of "Winning Poker Tournaments One Hand at a Time." Rincon is also providing special luxury hotel accommodations to poker players for as low as $81 per night. In addition, entrants who purchase a tournament buy-in $500 and greater will receive a $15 food coupon which can be used at several casino restaurants. Winner of the 2007 SHRM Workplace Excellence Award (Marble Award in the Large Company category) and owned by the Rincon San Luiseno Band of Mission Indians and managed by HCAL, a subsidiary of Harrah's Operating Company, Harrah's Rincon Casino & Resort is located at 777 Harrah's Rincon Way (33750 Valley Center Road) in Valley Center, CA, 20 minutes northeast of Escondido. With approximately 1,600 employees and an identity as a top resort-gaming destination, the casino offers state-of-the-art amenities and the unparalleled customer service that has made Harrah's a nationally recognized brand.